Step up into your truck in style with the RBP RX-7 Series step bars. 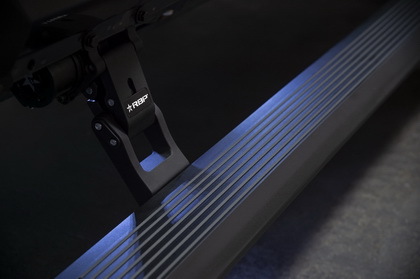 Our RX-7 steps feature a one-piece welded steel construction, and the patented design that is truly original. The RX-7 step bars feature a deeper pocket to actually fit your big boots! The wheel to wheel length design hugs your truck snugly, so they do not reduce ground clearance. Whether you are riding high on a lifted truck, or rolling on a stock chassis, the RBP RX-7 step bars are sure to have you getting in and out of your ride in high style. The paintable, textured inserts allow you to customize your steps for a set truly your own. The RBP RX-7 step bars include all mounting brackets and instructions and are easy to install. Featuring a new 3 year finish warranty, and a limited lifetime warranty for manufacturer defects - you can be sure you are covered, no matter what.